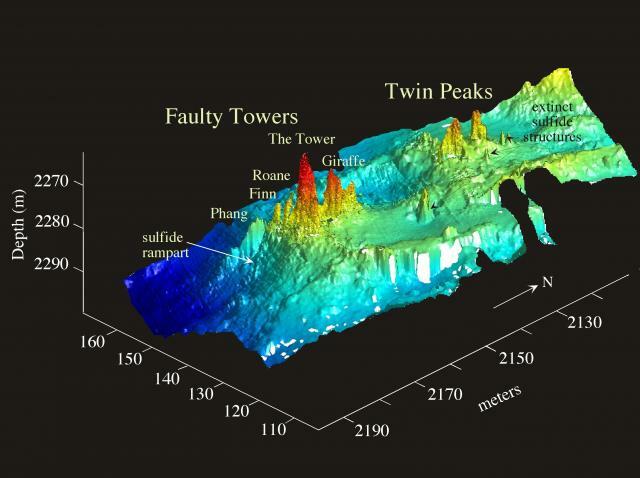 This centimeter-scale resolution bathymetric image of the east face of the Faulty Towers and Twin Peaks Complexes was formed using a 675 kHz scanning sonar mounted on the ROV Jason I. It was compiled from 115 precisely navigated vertical and down-looking surveys using Jason under remote control. The corresponding digital still mosaic of Faulty Towers is shown in the image Photomosaic of Faulty Towers at Mothra.